Commemorate the moment your paths first crossed with this personalized art. Commemorate the moment your paths first crossed and look forward to walking down the same road together. Featuring you and your sweetie's names and the important dates you share, this photo print by Philadelphia artist Patricia Carlin is a sophisticated way to commemorate a wedding or anniversary in either color or black and white photo prints. Designed and made in the US. Wood (5th anniversary), representing strength and a solidified relationship after 5 years. Walnut frame; made in the USA. Tin (10th anniversary), representing the flexibility of a successful marriage at the decade mark. Pine frame; made in the Spain. Platinum (20th anniversary), representing the enduring strength of your relationship after 20 years. European pine frame; made in Italy. Silver (25th), representing the radiance and refined purity of your marriage at a quarter century. Bonanza wood frame; made in USA. Gold (50th anniversary), representing your prosperous, treasured marriage at the mid-century mark. European pine frame; made in Italy. Click here to see the Intersection of Love outdoor sign. Patricia Carlin started out as an art director in Philadelphia, selling everything from potato chips to financial products. In 2001, a friend wanted help launching a glassware business. Patricia designed several product lines for the new venture. "We couldn't afford a writer at first, so I wrote my own copy for the glasses," Patricia says. The business did well, and Patricia found herself designing a range of tabletop products. When a publisher noticed the glassware at a gift show, they saw book potential. With their help, Patricia produced two books: "Glam Girl" and "Geeky Girl." Patricia has explored many techniques in her illustration, but simple line drawing appeals to her most. "For me, paring things down to their simplest essence is always the best way to understand them," she says. "After I had my daughter I rediscovered the power these little sketches have to tell a story. Drawing was a fun way to communicate without language." Northwest Framing strives to enhance the lives of their customers and colleagues by providing outstanding design and the premier custom framing experience, while increasing the value of their business. The company has been providing quality custom framing and framing products since 1974. The foundation of their success has been built on customer value, great product selection, high quality finished products, and community partnerships and enhancements. They believe that each of us has the opportunity and the responsibility to be the best, support our environment(s), and our communities. 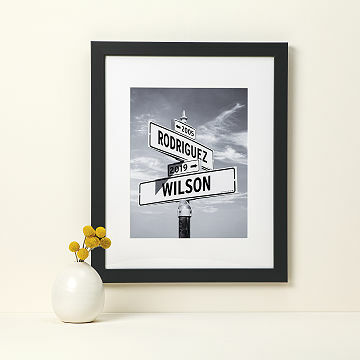 Inspired by the street signs of the iconic corner at San Francisco's Haight and Ashbury, the Intersection of Love photo print offers a unique, photographic representation of a couple's names and important dates in a visual metaphor of fatefully-crossed paths. "To enhance the lives of our customers and colleagues by providing outstanding design and the premier custom framing experience, while increasing the value of the business. Northwest Framing has been providing quality custom framing and framing products since 1974. The foundation of our success has been built on customer value, custom art and framing solutions, high quality finished products, and community partnerships and enhancements. We are committed to being the premier custom art and framing solutions provider in the Northwest and wholesale market. To accomplish this each one of our colleagues has the opportunity and the responsibility to be the best, support our environment(s), and our communities." Northwest Framing pays employees a starting wage of $13/hr., which falls within 10% of Multnomah County's living wage. PTO is available to all full-time (32+ hours / week) employees. Regular full-time employees are eligible to earn and use vacation time following a schedule of accrual (7 days in the 1st year of employment, up to 20 days in the 8th year of employment) PTO is accrued monthly, beginning from an employee's date of hire (or date of full-time status). Employees are eligible to begin using accrued PTO after their initial six months of employment. Metal frame fall-off and scrap pieces are recycled at 100%. Acrylic and matboard / cardboard scrap pieces are also recycled at 100%. These products have unique containers within our facility and are recycled through Waste Management. Foamboard waste is not recyclable, but is reused in alternative projects and internal packaging wherever possible. Surplus short pieces of wood are turned into small frames for re-use, donations, or sale. Some small cutouts are not recyclable due to the varying finishes on the product. Northwest Framing's contributions to specified charities are approximately .75% of sales. Additional prod-uct and labor donations take place through their stores. Most of these donations go to support framed products for auctions at schools, youth programs, animal shelters, and environmental organizations, including Youth in Focus, Woodland Park Zoo, Seattle Humane Society, Susan G Komen 3 Day walk for Breast Cancer, American Cancer Society, Washington State High School, SAFE Horse Rescue, Boys and Girls Club, Habitat for Humanity, Special Olympics, Ronald McDonald House, Art Institute of Seattle, the Seattle Seahawks, and Ben's Fund for Autism. In addition, they provide about $15,000 in gift cards and $10,000 in framed art donations for school and other community organizations within the communities of their local stores. Acid-free matte board, plexiglass, archival pigment ink, BonanzaWood® (natural source material), and Epson enhanced matte paper. The Intersection of Love - Photo Print is packaged in a partially recycled and fully recyclable/compostable box. There's one place—and only one place—where you'll find the Intersection of Love - Photo Print: UncommonGoods. Unframed print is not matted. This is a made-to-order item. If you order today your item will ship no later than 4/29/2019. At this time, this item cannot be shipped to P.O. Boxes or to APO/FPO or US Territories. Contact custom@uncommongoods.com with any questions. It was the perfect shower gift! Beautiful gift for my daughter! I really like the blue background---it pops. This was a gift for 50th wedding anniversary. So very unique, original, and personal. Everyone loved it. I would buy this item again as a gift! Product was a gift for my daughter and soon to be son-in-law and they loved it! "Uncommon" is a great term to use for your company. Your items are very unique and well crafted. The framing of the picture was excellently done. Thank you! This was not the run of the mill gift couples receive for their anniversaries. This is exactly why I like UnCommon Goods. . . . .original and refreshing. I recently shared my purchase with a colleague at work and they asked for the website. She agreed the gift is a great and unique. This was an anniversary gift for my husband. I wanted to combine our two names and the two significant dates of our relationship. It's both beautiful and unique.